Semogue 2000 vs Omega Pro boar brushes. 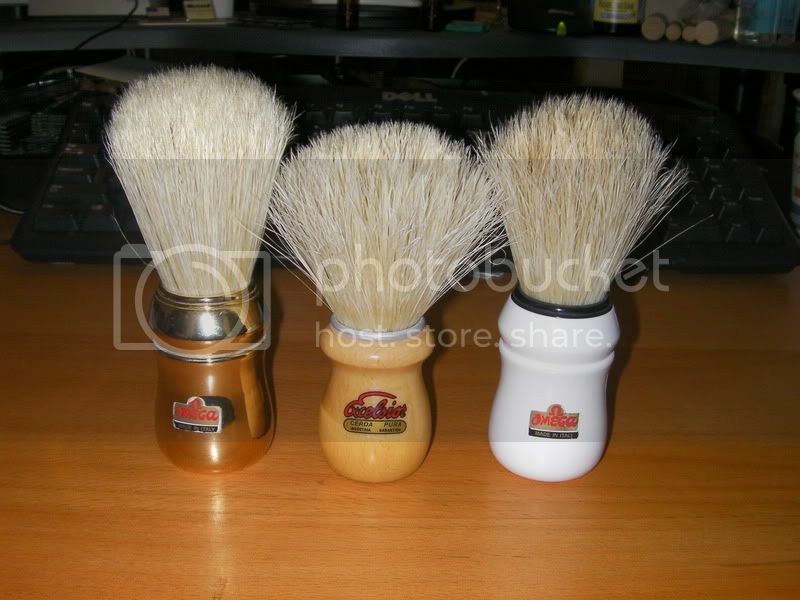 This is a brilliant guide that Zach wrote comparing two of the most famous barber shop style boar brushes,the Omega N48/49 PRO and the Semogue 2000. Thanks to Zach for giving me the chance to share this with you,gents. So I really like the Semogue 2000, a lot. Some aspects of it are my favorite across the board, of any brush. I have not spent any time or energy on this brush and I've been asked to compare it to the Omega pro brushes, and so here it is. I asked the wife to pack a 48, 49, and 2000 in a bag for me to take to work, where I can photograph them and write this up. Though I have a display shelf and storage shelves, I did not make it clear to pack a dry version of each and she picked 2 of them that were not dry. So, the pictures suffer, especially the overhead, which is almost useless. I will add a new pic tonight when I get home. You need all three of them. If you had to pick 2, it would be the 2000 and either Omega. I've decided that my views of the 48's superiority to the 49 do not reflect everyone's views, since it is an opinion after all, and that the difference is not so great as to make much of a difference at all. I always will say, however, if you want to try a boar, your first one should be a 48. If Paul at Connaught is out of 48s and only has 49s, not a tragedy. Once you get the baseline, you really should get many more brushes. You should experience the blur between boar and badger that Vulfix was able to pull off, or, if you prefer a small brush, again Vulfix. The Omega 48 is the tallest of the three brushes, and it has the same sized knot as the 2000, but it is not nearly as densely packed as the Semogue. The effects of this I will explain. So what are the differences between these brushes? The Semogue has 1/3 more bristle packed into the brush. The effect of this is a lot like the boar version of the Shavemac; the Shavemac is so densely packed with hair that it feels like a wall of badger on your skin; since badger is SOFT and does not absorb water (non porous), a LOT of badger rubbed on your skin like this has a feel kind of like rubber. Since boar is porous (permeable to fluids is my use of the word here) it doesn't feel like rubber, but a dense wall of boar from the 2000 feels different than the Omega offering. The Omega gives a more distinguishable tactile response; kind of like a lot of little fingers rubbing your face. The Semogue is more like a slightly number version (fewer and fatter fingers, for example) and a tad more backbone of course, based on the density. If you ever thought that an Omega had turned too soft on you or that you really want a scrubbier feeling, this brush is for you. In addition, the Semogue knot, when it blooms, is huge, almost 50% bigger than the 49. Again, though it's wet, you can see how much fuller the 2000 is. This is a very, very big brush; almost a brute! The density of the knot makes it eat soap a little bit more; you can counter this effect by lathering with a lot of water, as I like to do, then scooping up the foam that is created but not good for shaving, and pumping this back into the brush; if you pump your brush while you're lathering you'll use more product, forcing it deeper into the knot, and you'll have more soap for your shave. Since the 48 has such a longer loft (10% is a lot more than it seems) it requires a little more dexterity and a lot more soap in the brush to keep the Omega from flopping around; this is of course not a problem or a shortcoming, it just is what it is. If you know what you're doing or are willing to experiment until you get it right, this way that it is [is] a great way to be. Though the 49 has about the same loft, when you factor in the larger knot and the greater density into a similar loft, these brushes of course do not act the same at all. As big a brush as the 49 is, when you bring it to your face you will feel the difference. If you have detailed facial hair, this is going to get soap all over your face, no exactness here. The handle for the 49 is likely the most useful shape of any handle of any brush; it's perfectly ergonomic for lathering,. The 48 is similar though since it's a bit larger and doesn't need to be, probably it just 'is' to make this the bigger brush, it's not as good. However, both of these handles are hollow plastic, and though the SHAPE is the most useful of any brush, the handle CERTAINLY cannot be called the best handle; it's cheap plastic. The shape of the 2000 has to be modeled from the 49; and though it's smaller, its heft and its solid, dense feel make it a better 'tool' for the use of lathering. And don't ever worry about water seeping into this handle; the handle will last as long as the knot I'm sure. 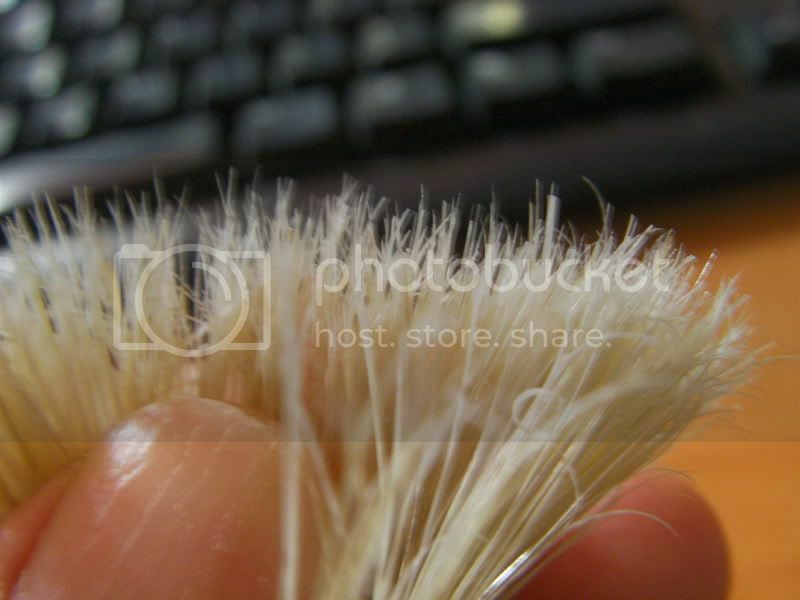 These are randomly picked bristles representative of the brush; I did not pick out thin ones or thick ones. Now a while back I surmised that this had to be a different 'animal'. 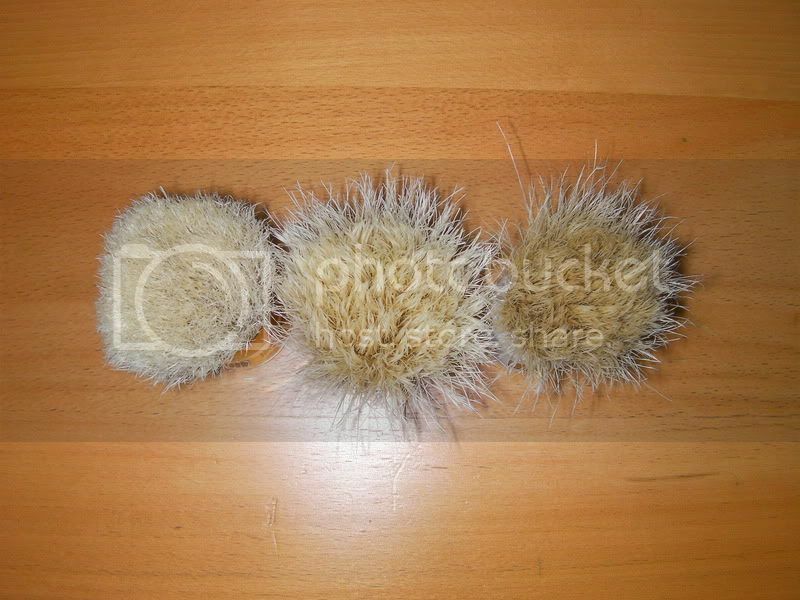 Although we call them 'boar' the source of these bristles are usually domestic pigs and not wild boar. I asked Leon at Vintage Scent to find out about this, and he said that although it is from a different source of bristle, it's still pig and not wild boar. So much for that theory. But, it is a very different bristle, with more backbone and with different characteristics. I like it a lot; I wish that it was 'boar'! This guy drinks a lot of water, therefore, and as previously stated, you will make a better lather if you let it soak, so that it does not steal from you. While this is NOT a "clipped boar" along the lines of a Burma Shave or a Jagger brush, Eric (GlassMtn) pointed out to me a short while ago that his had 'some' clipped bristles. I looked at it very carefully; I always look for split hairs right away to verify it's not a clipped brush, and finding them, I let it go. But Eric's more discerning eye asked me to look again, and if you look closely as well, you'll notice that it's a mix of (mostly) unclipped as well we some clipped boar. It's my belief that this brush has been 'shaped' like a Christmas tree is, as the final process to make it look perfect, and this caused some bristles to get cut. There is the occasional sensation of something like a 'prick' more than a 'skritch' but it's not at all unpleasant; again, had Eric not pointed this out I would not have (and did not) notice and did not think negatively about the brush after this discovery. 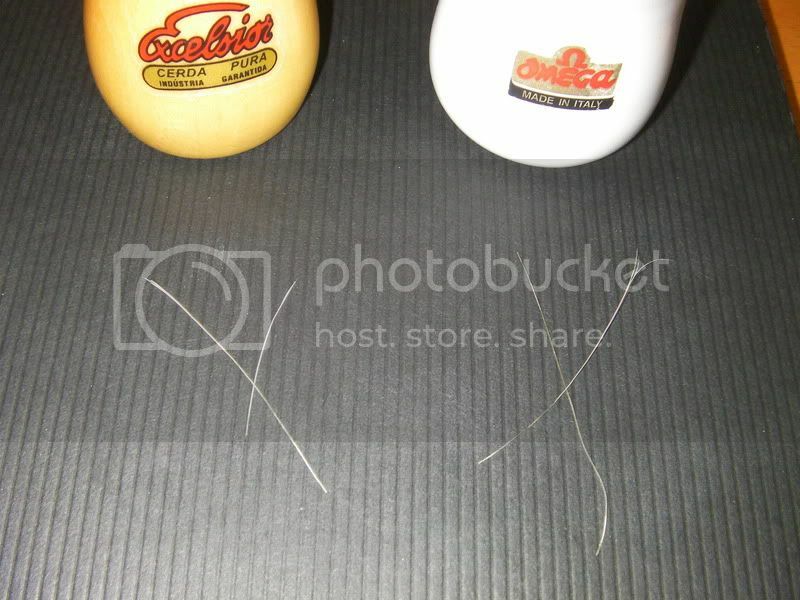 Take a look at the pic below and you'll see both split and the occasional clipped bristle. If you look at the 48, especially since it’s dry, you can see the tips take on a lighter white color; that’s because of the natural taper and the split of all the individual hairs, making it lighter than the shaft. You really don’t see this on the 2000. If you want a softer bristle, it’s the Omega; if you want the softest bristle possible, try the 31xxx or the Capo. Still, like good vs. evil, you have to have both; how can you feel softness if you’ve not experienced backbone? So there you have it in a nutshell; my advice is to take everything I have said with a grain of salt and buy all 3 and look and feel for yourself. I do promise that you will love these brushes, though. Especially if you're happy with a VDH boar; this is another world altogether that you deserve to be a part of. This Zach character seems like he knows a thing or two. Does he have a blog or something? (03-05-2012, 10:21 AM)Songwind Wrote: This Zach character seems like he knows a thing or two. Does he have a blog or something? No he doesnt,but maybe we can talk to him about it. He knows his boar brushes for sure. Excellent. Get Zach to join The Shave Nook. I had the Pro 48, and now I have the semogue 2000. I find to like the portuguese one better than the italian, since the knot is much smaller, and the handle is much better done: you can even face-lather with it (well, actually I don't strictly face lather with it, but I like to massage well my skin, even if I scuttle-lather), and you can hold it better when charging/whipping the lather in the bowl. As it has been said above, you need to have them pretty wet to work well (especially the semogue). I leave the "as-dry-as-possible" approach for my badgers, which are the ones I use more often, and I use my hog full of water and with a walnut-sized dollop of cream, or I put the puck of soap in the scuttle and keep charging until lather overflows. 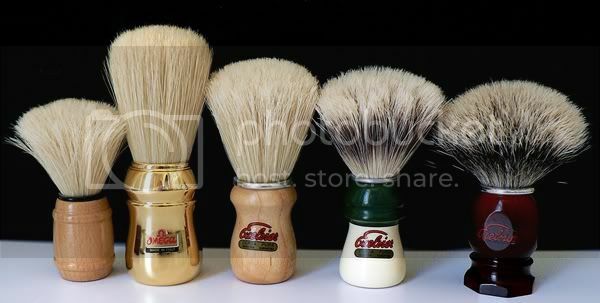 These brushes are thirsty and hungry beasts, whch will make considerable dents in your pucks, tubs and tubes if you use them consistently (as far as I know, the boar SOC is even hungrier), but will reward you with huge amounts of lather. Now I hear you say, Marc, but this is a waste of soap, most of the lather ends up down your sink! My answer: isn't it also a waste to drive a sports car at 200 km/hour? But isn't it worth it? That's a great write up Zach. Would you gents recommend the Sempgue 2000 for a face latherer? I've seen so many different suggestions but still on the fence about adding this bad boy to my rotation. I face lather about 70% of the time and use the Semogue 1438, 1470, 1800 and 830 and like all equally, probably the 830 and 1800 get more use. (03-05-2012, 06:40 PM)GMofmiami Wrote: Would you gents recommend the Sempgue 2000 for a face latherer? I've seen so many different suggestions but still on the fence about adding this bad boy to my rotation. I face lather about 70% of the time and use the Semogue 1438, 1470, 1800 and 830 and like all equally, probably the 830 and 1800 get more use. If you are a 100% face latherer,I will go for a 1800/1305/1250/820 or even the shorter loft ones like the 1520/1438 or 1470/1460/610. My fav of all?Right now, maybe the 1800,tomorrow Ill shave with it. First of all, Zach is good people and a treasured friend. He came to this country with his family from Greece when he was two or three years old. His father taught him to shave with a DE razor, a very humble boar brush, and Ivory soap. For Zach's first shave, his father wielded the razor. The next time, he handed it to Zach. Since they shared the razor, his father had Zach shave first with the fresh blade, after which he shaved himself. Zach's love of boar goes back to these primal shaving experiences. 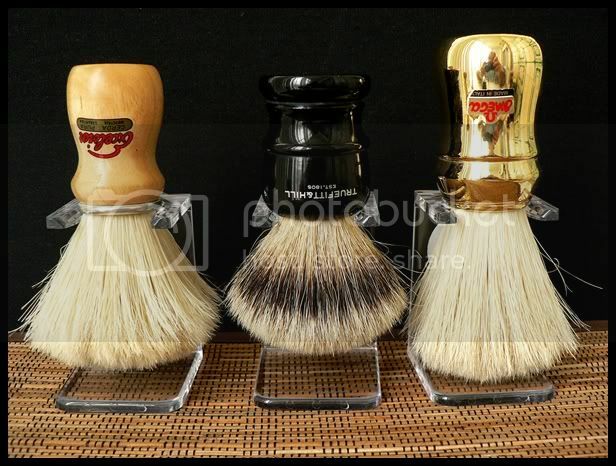 Traditional wetshaving forums used to frown on boar brushes, and I believe it was Zach who created the upheaval necessary to elevate the boar brush to a position of respect. Interestingly, Zach is very much a face-latherer and he favored the Semogue 2000 for face-lathering at the time he made this original post. (You'll notice that he said he preferred it to the 1305.) I might have to ask him what his favorite is now. Thanks for posting this, Teiste. An excellent post and thanks for the personal contribution, Murray. Well done Zach and thanks Teiste for sharing this! Question for those who own both the 2000 and any of the Pro Omegas, and with both fully broken in. I noticed that Omega bristles are thick, splay to very fine, almost like synthetic fibre. My Semogue 620 is completely different: very dense, thinner bristles but not as fine tips. Granted, I only had it for about a month. I have two Omega Pro brushes: 10098 and Proraso (short lofted 49). If soak an Omega too much - it becomes very soft and very floppy - but still very manageable, the splay is controlled (it doesn't flop all over the place the way the SOC did. If I soak it about one inch deep, it will have a good backbone, but during the first pass, after a minute or two it would soften up and loose some of the backbone. At that point though, it is time to start to actually shaving so it is not a necessarily a drawback otherwise I'd might stand there lathering for a hour. 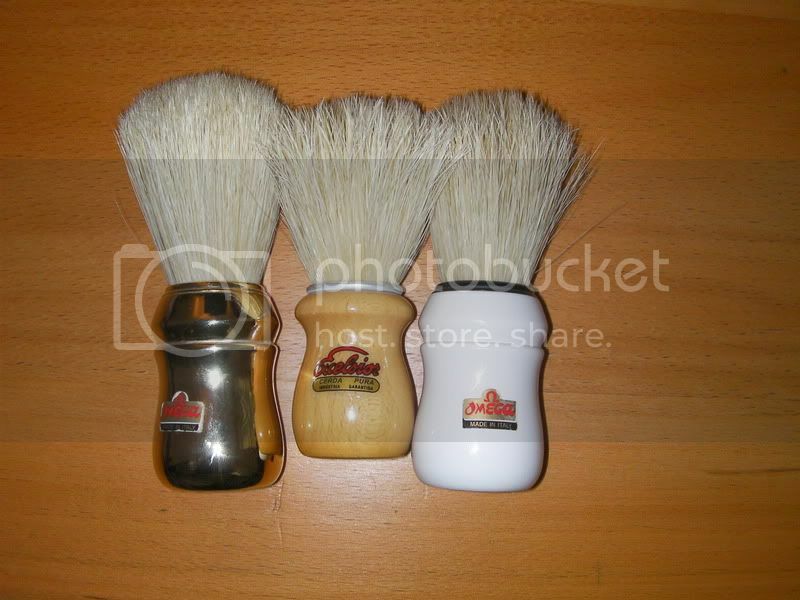 How does the 2000 compare here in terms of bristles, backbone, splay etc? I had a 2000 (and a SOC) - they both splayed way too much for my taste.